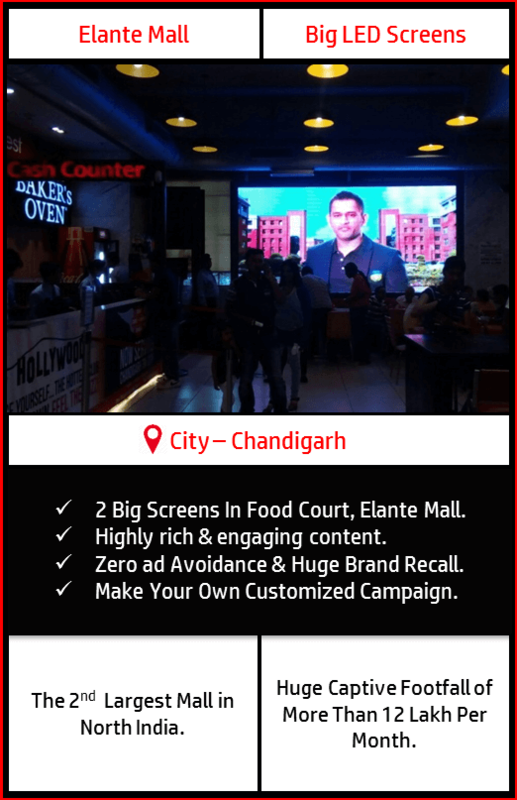 Advertisement Campaign on 2 BIG LED Screens at Food Court, Elante Mall, Chandigarh. Target a Massive Captive Audience Crowd of 8 Lakh+ per month. Eye-Catching & Engaging content keeps people thoroughly entertained. Make your own advertising campaign by filling the details and choosing from a variety of strategically made customized options. All Ads would be played in the prime time band of 1200 Hrs. – 2200 Hrs. = 10 Hours in a Day. The creative is to be provided by the client itself in High-resolution Mp4 format. The medium is quite flexible and the client is authorized to deliver the message by playing different ads on shuffle basis in a single Ad campaign, accordingly total number of slots chosen would be distributed for different ads. For any Further Customization Click Here. 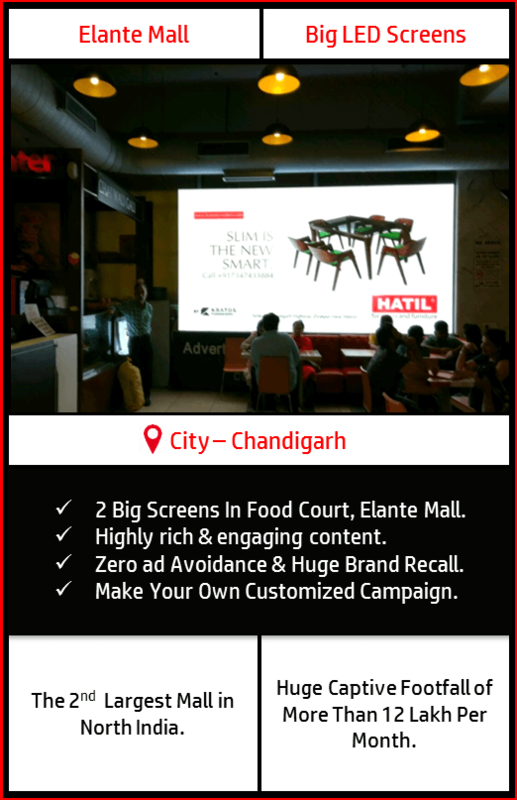 The incredible crowd targeting capacity is the most influential reason that force All Brands to advertise in Food Court, Elante Mall, Chandigarh. It targets Population exceeding 12.5 Lakh people within a month. A Massive Captive Audience Crowd of more than 9 Lakhs people per month is targeted spending at least 1 hour quality leisure time while having their meals. Hence, ZERO AD AVOIDANCE. Strategically located 2 Gigantic LED Screens covers each nook & corner producing a SYNERGISTIC EFFECT i.e. 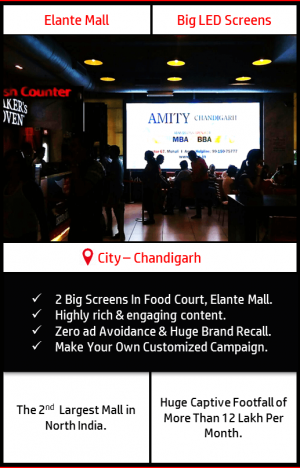 1+1 = 11 times more mileage than any other advertising medium in town. The Most reliable medium which provides the flexibility even to run Multiple ads on shuffle basis in a single campaign. Hence, an effective advertising medium giving clients the privilege to convey their entire message properly in different & unique creative ways. The Brands associated with the exclusive media grabs a Huge Brand recall as visual repetitions are on the extreme hike. Highly Rich & Engaging Content: BIG LED Screens offers a highly engaging & entertaining content for the viewers. Exciting & entertaining videos grab the attention of the viewers and engage them to such an extent that the advertisement in between the videos are totally seen, noticed and can’t be avoided at all. Huge ROI (Unconquerable medium among all media in town). The log numbers for the campaign would be given to the client once the campaign is booked. The client can track its campaign by the Log Numbers provided.